The hotel dates from the 15th century and boasts an elegant drawing room, oak-panelled bar, wood burning fireplaces, and 28 bedrooms and suites set in nine acres of grounds. The luxury hotel also has nine acres of gardens and parklands which you can explore, with further surrounding countryside in the South Downs National Park. Then, down a long, curved driveway from the main entrance sits the striking contemporary spa and the spa suites – a surprising and startling contrast to the Elizabethan manor. The modern block-like building looks like something out of a 1960’s bond movie from the outside, but is sumptuous, modern and slick on the inside. 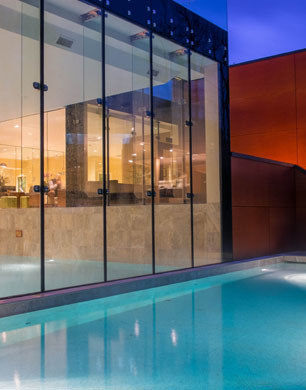 Floor to ceiling windows flood the space with natural light, and the focal point is on the indoor heated swimming pool, which flows into a heated outdoor pool, with uninterrupted views over the hills. I checked in and was taken up to my spa suite; a light-filled room set above the outdoor heated pool, with contemporary interiors, a pampering bathroom with an enormous stand alone bathtub, a large walk-in rainshower room, lovely Elemental Herbology products, and its own private terrace area with stunning views over the South Downs. Not too shabby! The bathroom has a window into the bedroom, so you could even watch TV from the bathtub if you wanted to. Head chef Stephen Crane put together a delicious country inspired menu with game meats (think wood pigeon and pheasant with truffled chestnuts), fish (exquisite cod served in a mussels sauce) and vegetarian options, all sourced locally from Sussex.